Hi everyone! I like winters especially our famous Delhi’s winter but it also take a toll on the skin and hair. In winter s, my lips get dry therefore; I have to give extra hydration and attention. 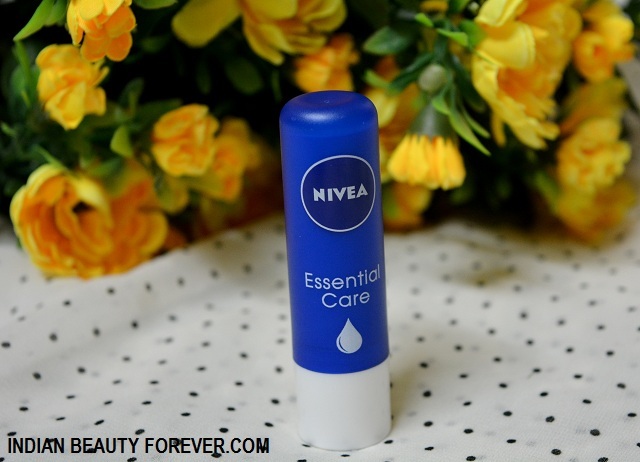 I am testing a couple of lip balms at the moment out if which This Nivea Essential Care Lip Balm has become my favourite. Nivea has so many lip balms to cater to different needs. I still like their Fruity shine lip balms. 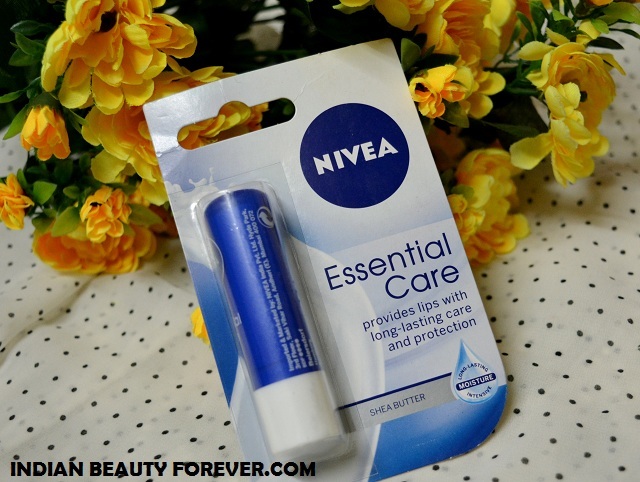 Price: Nivea Essential Care Lip Balm is priced at 100 Rupees. Key Benefits: Essential Care provides long lasting care and protection and is enriched with Jojoba Oil and natural Shea butter that helps prevent moisture loss, leaving lips soft and smooth. 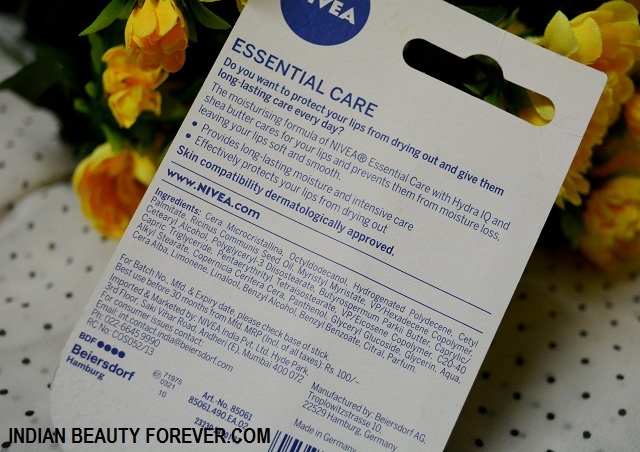 The lip balm is packaged in a bright navy blue retractile tube. It smells good with mild sweet scent but tasteless. It is colorless and very moisturizing. In winters, my lips get very dry and flaky. Even when I use lipsticks, my lips will get flaky and that is something that doesn’t look nice at all. I have a couple of colored lip balms which I like it wear during the day time but colored lip balms are low on hydration aspect as compared with the colorless ones. Here is this lip balm comes into play. 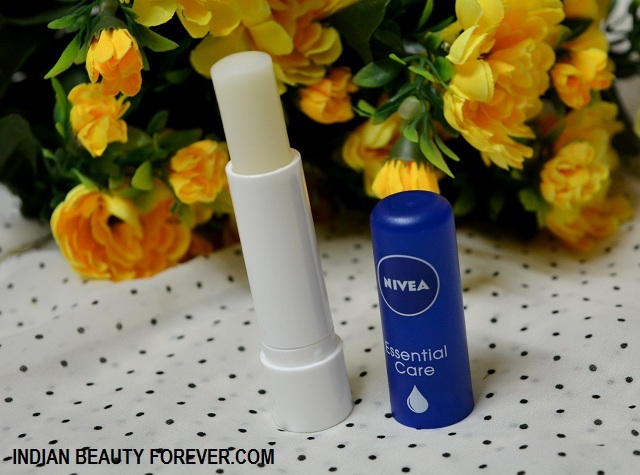 It gives maximum hydration and keeps my lips moisturized throughout the night. I wake up with nice velvety supple lips. During the daytime, I use it before applying my lip products to keep the lips moisturized. It is enriched with shea butter and jojoba oil that heals and nourishes the lips.It is quite handy to be taken in clutches and small bags. I have used a lot of colorless lip balms but honestly, this lip balm has something which has made me realize that I will definitely purchase it. Reason for this absolute liking towards would be its mild fragrance, tube packaging, so, no finger dipping, Cute blue packaging, very hydrating and this lip balm’s capability to keep lips soft for a longer time. It also heals the chapped lips. I tend to peel the flakes due to which the lips gets more chapped., thankfully it heals them overnight. Take: I will highly recommend this lip balm if you’re looking only for the hydration purpose. PR Sample review is unbiased as always!